Children's room with two cots and a mattress (2 m x 1.40 m). WELCOME! 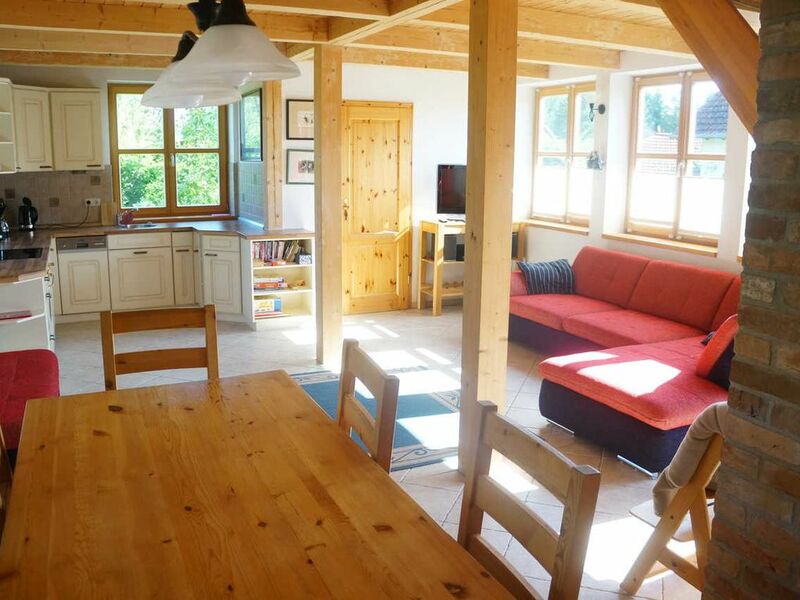 The house offers on the ground floor a large living room with modern fitted kitchen (dishwasher, stove with glass ceramic, fridge), dining table, sofa, TV, underfloor heating and an additional heated with wood kitchen stove. Through a large glass double doors to the terrace with garden furniture, barbecue and small sandpit is achieved. The well-kept garden area is accessible from the terrace. Also on the ground floor one bedroom with two single beds, a guest (Wb, WC, D) and a small utility room with washing machine. Upstairs is another large bathroom (corner bath, shower, WB, WC, floor heating) overlooking the lake. There is also a double bedroom and a room with two cots and a A mattress (2 m x 1.40 m) In addition, the upper floor has a gallery with large panoramic windows. The staircase in the house is secured for children with protective grilles. 2 highchairs and toys are available. Booking breakfast is not possible. Linen: You have the option of booking additional bedding or bring your own. Price per package: 6,50 €. Towels: You have the option of booking additional towels or bring your own. Price per set (2 towels and 1 bath towel): 6,50 €. Firewood: each basket for 4.50 € bookable. There is no deposit for this holiday home. On the property there is another house. Wireless: not available. In the resort is located on an LTE network of Vodafone. (No UMTS) We recommend for ipad and Co a Vodafone data card with LTE option and an LTE enabled device. Idyllic between Fürstenberg and the cultural city of Neustrelitz lovingly designed Tudor - House in Godendorf Teerofen. Forests and lakes are within walking distance. In the village there is a horse farm with a petting zoo and an inn to stop by.